The 418 Squadron Association, together with the Alberta Aviation Museum, has acquired a B-25 Mitchell bomber which it intends to restore to display condition. 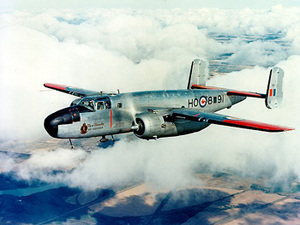 This particular aircraft had carried the RCAF designation RCAF 5273, serial number 44-30791, and had been the property of Northwestern Air Lease. The airframe sat in a field on a farm for quite some time before the 418 Squadron Association and the Alberta Aviation Museum were able to procure it. The airframe, which was originally a B-25J, will be restored to a B-25D specification, and will carry the tail number HO 251, of 418 Squadron. The left side of the fuselage will bear the 'Armed Knight's Head' crest, and the right side will carry the 'Daisy Mae' emblem. There is a rather colourful story behind HO 251, the Daisy Mae. In 1957, F/O's 'Terry' Champion and M. Chykaliuk were returning from an excercise at the Bittern range. Just after they had landed at the Edmonton Municipal Airport, but before the aircraft had come to a stop, the braking system failed, and the rolling aircraft put its nose right through the hangar wall. Fortunately, there were no fatalities, though the aircraft was written off. We are currently looking for volunteers to assist with the B-25 restoration. Anyone interested is welcome to contact the 418 Squadron Association. Also, donations of tools, pictures, and books that would be of assistance to the project are being accepted. Tax receipts will be issued for any donations exceeding $10.00 in value. For further information on this project, please visit the B-25 Restoration website at www.b25.ca.